Sharing this one today, since it's so simple and I'm in a rush. Found the little ditty at SurLaLune and whipped up some clipart to go with it. Sorry for the picture quality--I'm a bit rushed today. 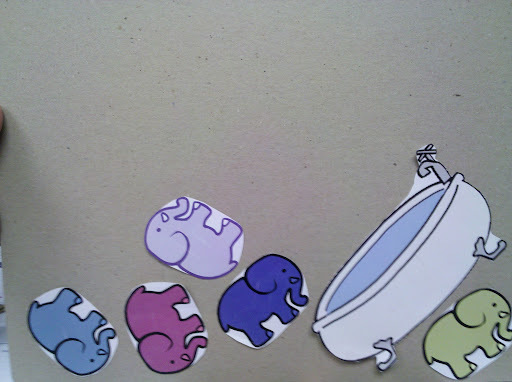 Here's the clipart for the bathtub and elephants. (I love how popular that bathtub is with children's librarians--I see it everywhere). 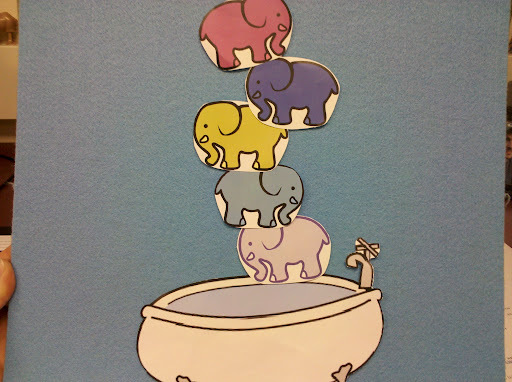 I just used Word to recolor the elephants. Laminate and velcro dot and you're good to go. I made two copies, and attach the second set to the back of the flannel board before storytime. Then when 'Crash! They all fell in!' I can just flip the board really quickly for a bit of a twist/surprise for the kids. Awwww, I really want to re-do my "Five Elephants" flannel with colorful elephants after seeing yours! Very cute! I like the idea of flipping the board upside down. y'know I stopped looking at Surlalune a while back. I don't know why i became frustrating, but I'm gonna give it another shot. That was an awesome post thanx a million! What a fun idea to flip the board and quickly get the all-fall-down image in front of the kids. Now I am thinking what other rhymes I could use this technique for! Thanks for being a part of Flannel Friday!